This reverse belly bar features a large sterling silver entwined hearts design which is set with very light pink stones, and the 10mm barbell is inserted downwards into the piercing. 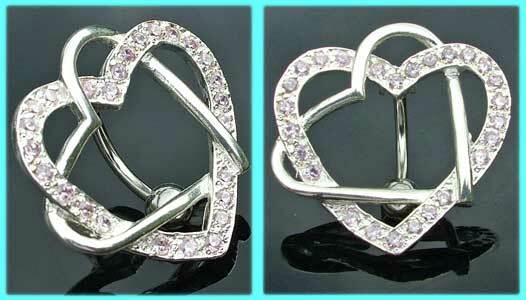 These reverse belly bars features one plain sterling silver heart and the other heart is set with very pale pink crystals. The design measures 27mm x 27mm and the piece is worn by inserting the 10mm surgical steel shaft downwards into the piercing. These navel bars are also available with clear and light blue stones. The best eCommerce software by ShopFactory powers P9753. All-in one eCommerce and shopping cart software.